For many men — and certainly for me — it's a relief to watch guys get credit for being emotionally available, rather than for being moronic or violent. Zombies aren't constrained by traditional gender roles. In most zombie narratives, that's because zombies aren't constrained by any social norms. They're mindless, shambling monstrosities, who grunt and eat and kill in much the same way no matter what gender they were before they were bitten. But Netflix's “Santa Clarita Diet,” which has just released its third season, features zombies with their higher brain functions intact. And they use those brain functions to create strong female characters and — even more unusually — emotionally supportive male ones. In Santa Clarita, the undead walk, women are at the center of their own narratives and men are there to help them. In Santa Clarita, the undead walk, women are at the center of their own narratives and men are there to help them. Joel embraces those roles. After Sheila is turned into a zombie, Joel's job in the series is to help her be the best zombie she can be, which means cleaning up the terrifying remains of her meals and cheering her on in her new business ventures. It also means overcoming his own fears when she wants to be daring and generous and bite terminally ill patients so they can rise again as healthy zombies. Joel spends much of the third season with the stereotypically female romance dilemma of whether to accept a proposal from his exciting but dangerous lover. The reversal of gender roles in “Santa Clarita Diet” isn't just the result of a zombie transformation. It infects other, fully alive characters as well. The Hammond's daughter, Abby (Liv Hewson) is not a zombie, but she, like her mom, is determined, and fiercely political. When she sees a boy bullying another girl, she picks up a lunch tray and floors him with it. At the end of season two, she bombs a fracking site. She spends much of season three dealing with the fallout. The reversal of gender roles in “Santa Clarita Diet” isn't just the result of a zombie transformation. It infects other, fully alive characters as well. Abby didn't bomb the fracking site alone. She had help from her engineering genius neighbor, Eric Bemis (Skyler Gisondo). Eric is, emphatically, the sidekick in the Abby-Eric partnership. He would never bomb a polluter, or anyone, on his own; as he says repeatedly, he's scared of everything. He helps Abby because he's infatuated with her, in part because she is so forthright, courageous and determined. Just as all the women in action films are swept off their feet by the heroes' manly feats, so Eric is both terrified and exhilarated by Abby. And as with those traditionally male action heroes, Abby's impulse is to try to protect her weaker romantic interest from the danger she courts. Eric knows he can't be as brave and cool as Abby, but he wants to help. By, for example, handing her the knives to stab zombies. It's not that unusual for men in sitcoms to be disempowered, inept Homer Simpson-esque bounders. But Joel and Eric aren't inept, and they're not bounders. “Santa Clarita Diet” isn't about how men are useless doofuses who must be cared for and educated by women. On the contrary, much of it is about how men can be helpful and nurturing and gallant. It's just that they're helpful and nurturing and gallant because they help the women in their lives pursue their careers, and fight for justice. It's easy to see Abby or Sheila running for office in the Trump era on a feminist, environmentalist, undead-rights ticket, with Joel and Eric happily flyering on their behalf. No doubt the MRA moron that Sheila dismembers would argue this vision of men supporting women's narratives is unfair and condescending. But I think for many men — and certainly for me — it's a relief to watch a story in which guys get credit for being emotionally available, rather than for being violent and domineering. It's tedious, and more than a little stifling, to be told over and over that the only way to be a man is to pick up a firearm and kill someone with it. It's even more wearisome to be told by sitcom after sitcom that men are domestic disasters, good for little except belching and demanding that their families cater to their stupid whims. Discussions of diversity focus, rightly, on providing more visibility and more interesting role for marginalized people. 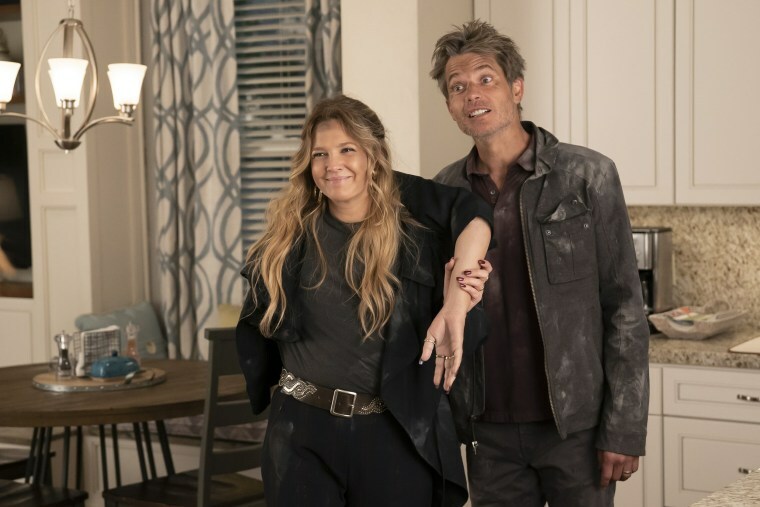 But “Santa Clarita Diet” shows how eviscerating those old stereotypes allows everyone, of every gender, to rise anew. There's some mess admittedly, and you may have to get new carpets. But both Sheila and Joel would agree it's worth it.